I've read in multiple books and articles that during the French Revolution the address of monsieur / madame (my lord / my lady) was suspended in favor of the more égalité-friendly citoyen / citoyenne (citizen). The change of address is usually mentioned and then quickly passed by. But, assuming my understanding is correct, the above raises an obvious issue to me: how was a good Republican supposed to address someone who was not a French citizen? There were many foreigners in France during the time of the revolution, and presumably not all of them were granted honorary citizenship. And of course the French Republic continued to deal with foreign nations, albeit often on unfriendly terms. How was a citizen of the revolutionary government supposed to address those who fell outside the bounds of the citizenry? Il faut bien entendre que la notion de nationalité n'existait pas au cœur de la Révolution française. Ni le mot nationalité, ni le mot citoyenneté n’étaient employés à l’époque. Les hommes et les femmes utilisaient une série d’expressions telles que « le droit du citoyen », parfois « les droits de citoyen français », la « qualité » ou encore le « titre » de français », le « titre de citoyen », etc. 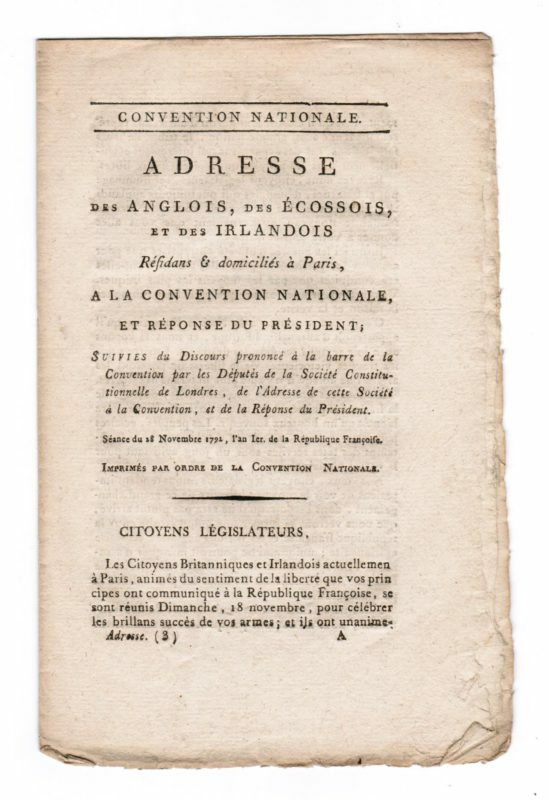 Or ce mot de « citoyen » effaça de fait les distinctions entre l’appartenance légale à la nation, l'engagement patriotique et l’exercice des droits politiques, et ce, dès 1789, avant même qu'il n'y ait une véritable constitution... On comprend que la seule contrainte à cette définition de l’identité politique est une contrainte de lieu et d’opinion, d’adhésion, pas une contrainte de sang ou de nationalité même juridique, pas une contrainte d’acculturation longue non plus, car cette adhésion peut être immédiate quelle que soit son histoire personnelle, ou refusée durablement même si on passait beaucoup de temps sur le territoire. Although this is not conclusive, it would appear that everyone was, theoretically at least, referred to as 'citizen' (citoyen, citoyenne), regardless of nationality. How much consistency there was in this, even when referring to people who could not be considered foreign, is debatable. Jean-Paul Marat, described as "one of the most radical voices of the French Revolution" published a letter in his publication l’Ami du Peuple (10 December 1790) which uses 'monsieur'. Marat himself used 'M. Necker' (M. = monsieur - Jacques Necker was a Swiss German banker) when denouncing the deposed Louis XVI's finance minister. On the other hand, Louis XVI was referred to as 'Citoyen Louis Capet'. Foreigners could, and did, participate in affairs at both the local and the national level. Initially, at least, they had almost the same rights and duties as the native French. Those who did not accept the new regime were not deemed worthy of the title 'citizen', though this did not suddenly happen, and nor was there necessarily agreement on who was or was not 'worthy'. Other foreigners sought refuge in revolutionary France to escape persecution for their radical beliefs in their own countries; they were deemed worthy of the title 'citizen'. used expressions “unworthy of a French Republican,” such as “excellence” and “serenity,” while minister at Zweibrücken. "to avoid any difficulties over etiquette"
It depends on the situation. If you talk with a person in the street, you do not really know his/her citizenship status. If you talk officially with a foreign diplomat, you address him as he is expected to be addressed in his own country. The situation was analogous in Soviet Union. There were two forms of addressing: "tovarishch" (camarad) and "grazhdanin" (citizen). Originally "tovarishch" was used by the members of the communist party to address each other, but later spread wider. The neutral form was "grazhdanin", and of course no one really cared what your real citizenship is. Not the answer you're looking for? Browse other questions tagged political-history 18th-century language french-revolution or ask your own question. Did collective punishment of families occur during the French Revolution? Why did the French Revolution bring secularism? What happened to the french overseas colonies during the beginning of the french revolution? What happened to the French royal navy during the french-revolution? During and right after the French Revolution, how did France maintain and operate such a big army all over Europe? How direct was the Enlightenment's role in the French Revolution? When and who did the Legislative Assembly banish from France during the French Revolution?